Christmas celebrations are around the corner and 2017 is almost upon us. 2016 has been another exciting year for the VDF category. Today some 749 producers are involved in creating Vin de France wines with varietal/vintage on the label across the Hexagon, with Vin de France representing a total of 16% of all French still wine exports. An amazing 77 million bottles (75cl) of Vin de France with varietal on the label were exported totalling a value of 140 million Euros. With market share healthy in a number of markets – UK (23%), Netherlands (16%), Germany (15%), USA (10%), China (7%), Belgium (6%), Canada (4%), Japan (3%), Sweden (2%), and other countries (14%) – the US in particular is a classic success story for our category, with quadruple increases in the past two years in volume exported of 7.17 million bottles, totalling a value of 18.3 million Euros (3.8 million Euros in 2013). We must also underline the very good results observed by Vin de France Cépage with a total export increase by 4%. And what a year 2016 has been. We kicked off with our annual Best Value Selection tasting in Paris, welcoming 45 international buyers to taste their way through nearly 400 wines. 118 wines were selected, of which 17 were awarded Gold medals, to become ambassador wines for the category in the marketing activities across the year. Their first port of call: Prowein, where our stand was as ever busy, and our varietal tutored tastings well attended. And from there – well the world was our Vin de France oyster – with star appearances of our wines in Canada, the US, mainland China, Hong Kong and Japan to name just a few. Feedback from the international buyers has been super positive, and I think Marc Reichertz, buyer at Liberty Wine Merchants in Canada sums our appeal up well when he said: « The Vin de France category offers a perfect entry into the world of French wines. And you also find innovative winemakers taking chances and blending grapes you don’t find often to sometimes thrilling effect. » My congratulations to all the talented wine-makers who contribute so brilliantly to our category. We have high hopes for 2017, and to start the ball rolling I invite you to register your wines for our next Best Value Vin de France Selection tasting. Registrations are free and now open! To register and for more information, click here (+ lien vers site). As always, the selected wines will gain international exposure to both trade and consumer audiences throughout all promotional activities organised by ANIVIN DE FRANCE abroad in 2017. 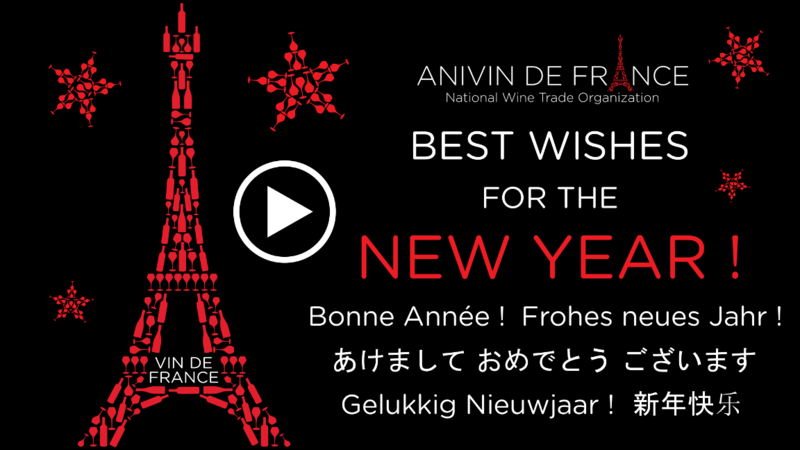 Now is time for me to wish you all, on behalf of our president Serge Tintané, his board, and the whole team at ANIVIN DE FRANCE, fantastic Christmas celebrations and all the best for the New Year. See you on the blog in 2017!